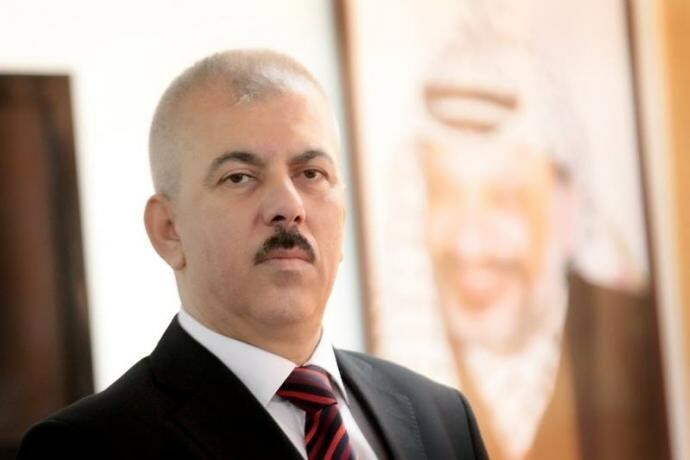 According to the PNN, Dr. Hanna Issa, professor and expert on international law, strongly condemned the action, saying that occupation authorities provide settlers with water, while depriving Palestinians of their own sources. Settlers in the occupied West Bank reportedly get an unlimited supply of water amounting to about four times more than Palestinians' consumption of water. Issa added that occupation authorities consume about 80% of the mutual water wells, despite the fact that 80-95% of them are located in Palestinian areas, pointing out that this is water theft, and in contravention of international law. Issa also stressed that Israel has continuously implemented a policy of displacing Palestinians, separating them from homes near water sources. Israel also prevents Palestinians from digging wells without military permission, while giving privilege to all illegal settlers. Issa reiterated that Israel was an occupying power and had no sovereignty to tamper with water sources, according to the fourth Geneva convention. 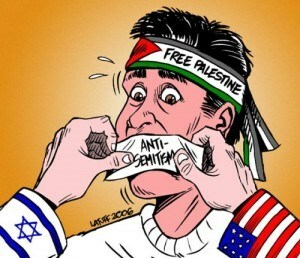 He also demanded Israeli withdrawal from Palestinian land, according to UN Resolution 242 (1967) and Resolution 338 (1973). 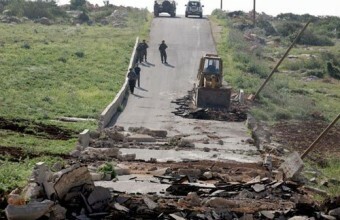 The Israeli Occupation Forces (IOF) demolished Thursday a Palestinian-owned shed in Idna town to the west of al-Khalil. 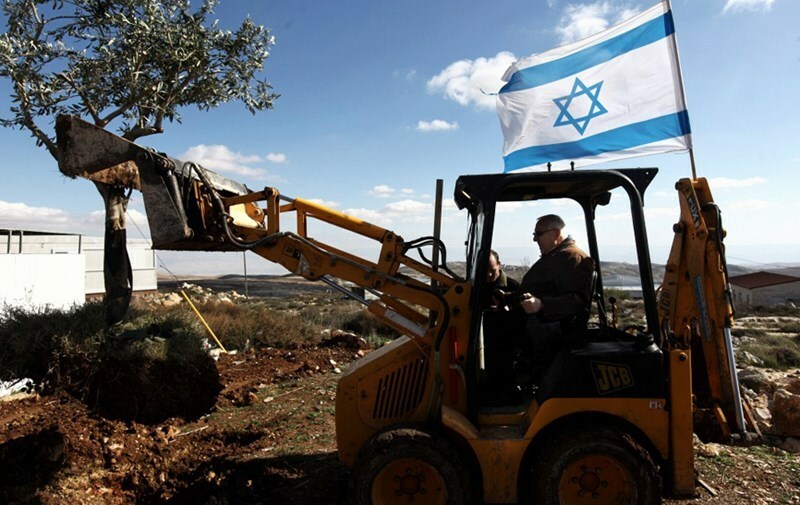 Local sources reported that Israeli forces using military bulldozers started since the early morning hours demolishing a 1,000 square meters shed belonging to a Palestinian farmer under the pretext of being built without permit. A mobile home was also demolished in a nearby area in the town, the sources added. Dozens of homes and agricultural facilities were threatened with demolition for being located in area C, the largest division in the West Bank comprising 60 percent of the territory which is under full Israeli control. 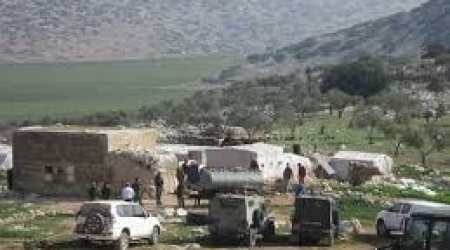 The Israeli military forced 19 Palestinian families to leave Khirbet Bzik village, near Tubas, on Tuesday morning, under the pretext of carrying out military exercises for two consecutive days. Local sources reported that more than 100 of the residents were forced to evacuate their houses in the morning hours, as a result of the military carrying out exercises between the houses, Al Ray Palestinian Media Agency reports. The military was apparently impervious to the danger imposed to some 60 children in the neighborhood, in the case that any of the devices exploded. Israeli forces also destroyed a number of houses and tents owned by the family of Salem Ektefiat, from the Daba' region, near Jericho. The Daba' incident involved seven families of Jahalin Bedouin whom the military expelled from inside the green line, in the Arad area, after destroying their houses last year. 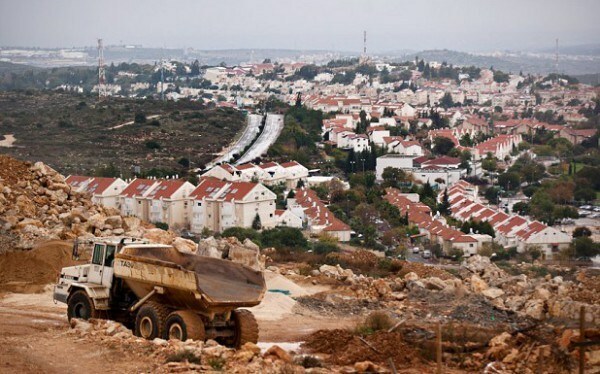 The Israeli Occupation Authorities (IOA) issued a military order to confiscate more than 500 dunums of Palestinian-owned land in Beit Ula to the west of al-Khalil, coordinator of the popular committee against settlement Issa Umla said on Tuesday. Umla revealed that an Israeli court has recently issued the confiscation order at the expense of Palestinian agricultural lands adjacent to the separation wall. He pointed out that the agricultural land has been targeted by Israeli forces along the past 20 years under the pretext of being located in area C, the part of West Bank under full Israeli control according to Oslo accords. “Contacts are being currently made with a number of human rights institutions and lawyers to stop the catastrophic confiscation order which paves the way for more Palestinian land grab in Area C,” he said. Israeli courts are only tools to suppress our people and confiscate their lands, he said. Abu Leila pointed out that it is not the first time when Israeli authorities resort to courts in order to confiscate more Palestinian lands in favor of settlement expansion. Israel systematically works at seizing Palestinian lands for establishing more settlement units and to expand the already built settlements at the expense of Palestinian-owned lands in total violation of international laws and resolutions, he added. He called on human rights institutions and the international community to put an end to Israeli continued violations and confiscation policy. Israeli authorities, Tuesday, notified local residents of At-Tabban, a small village to the south of Hebron, of demolition orders for two animal barns and a residential facility in the village. 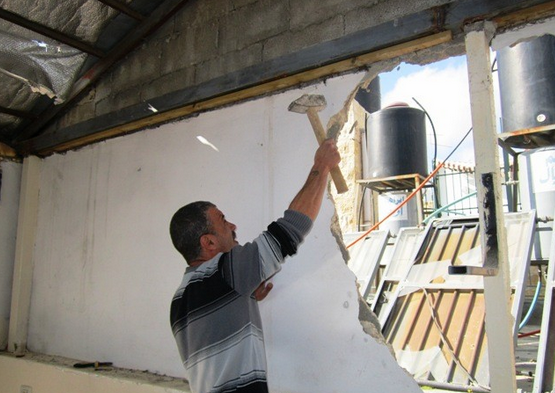 Rateb Jabour, of the Anti-Settlement Committee in Hebron, said an Israeli army force broke into the village and served notices to Nasser Abul-Abed and Samir Hamamdah, two local residents, informing them that the said structures would be demolished in a week. Jabour said that more than 120 similar notices -- in which the demolition of Palestinian-owned animal barns, residential structures, tents, fodder warehouses and water tanks were included -- were handed to local villagers last year alone. Such demolitions are frequently carried out by the Israeli army and the Israeli Civil Administration in Area C, which is under full Israeli control despite being in the West Bank, on unpermitted construction pretences. 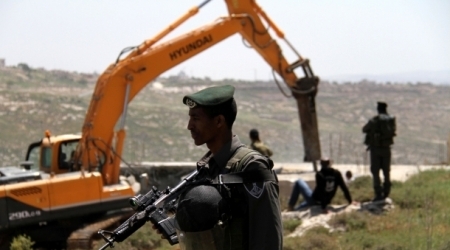 Issuance of construction permits for Palestinians living in Area C, under full Israeli administrative and military control, is strictly limited, forcing Palestinians residing in such areas to construct without obtaining the necessary permits. Area C, teeming with Israeli settlements and outposts, makes up 60% of the total area of the West Bank, making the chance of a viable Palestinian state near to impossible. In realted news, Ma'an News Agency reports that Israeli forces have confiscated hundreds of dunams of Palestinian land in Beit Ula town, northwestern Hebron, under the pretext that the property is "state land." 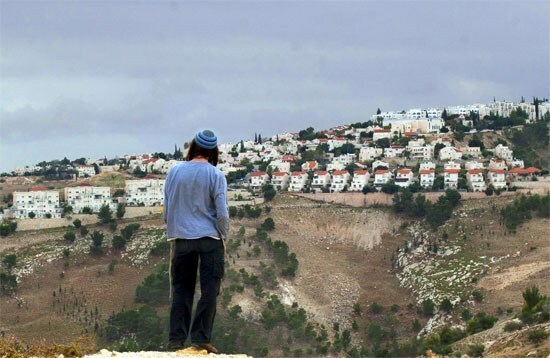 An Israeli court issued an order, earlier in January, for the confiscation of hundreds of dunams in the al-Mekhath and Attus areas of Beit Ula, to "Judaize" Area C and empty it from its original residents, coordinator of a local popular committee, Issa al-Emla, said. Al-Emla added that owners of these lands have farmed them and resided on them since the Ottoman era, and that Israel started raiding and razing the lands in 1982, in preparation for seizing them. 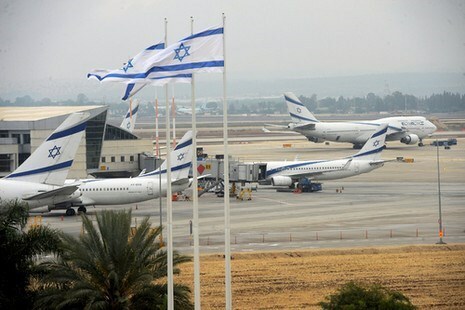 In addition that Israel was executing its plans to take over Area C, which is around 60 percent of the West Bank. The confiscated lands belong to Usama Abu Nasir, Farid al-Latif Atrash al-Emla, Ahmad Abd al-Rahim al-Emla, Hamdi Abd al-Muti al-Emla, Harbi Abd al-Muti al-Emla, Muhammad Khalil Abd al-Aziz al-Emla, Issa Abd al-Hafez al-Emla and Fares Wahid Abd al-Aziz al-Emla. Issa: Israel's demolition of Palestinian homes "ethnic cleansing policy"
The Islamic Christian Authority for patronizing Jerusalem and holy sites condemned Israel's demolition of 42 Palestinian homes and structures in the West Bank and Jerusalem during the current month as part of its "ethnic cleansing" policy. In a press release on Sunday, secretary-general of the Islamic Christian Authority Hanna Issa stated that Israel displaced 77 Palestinian civilians, half of them children, after demolishing their homes between 20 and 23 January in Ramallah, Ariha, Jerusalem and al-Khalil. Issa said that Israel's systematic demolition of Palestinian homes and its displacement of their residents violate the international law, especially the 1948 universal declaration of human rights, which protects the rights of any individual to housing. He underscored that Israel flouts human values and the rules of international humanitarian law, which prohibits it as an occupying power from demolishing public and private property. He also pointed out that the UN Office for the Coordination of Humanitarian Affairs in the occupied Palestinian territories (OCHA) had released multiple statistics revealing Israel's intent to expel the Palestinians from their lands and appropriate them for settlement expansion projects. The Israeli occupation authorities (IOA) pushed a Palestinian citizen to knock down a farm of his own in the southern West Bank city of al-Khalil. The farm owner Moslem Abu Juheisha said the IOA impelled him to demolish his 1,000-square-meter-large ranch and to evacuate the cattle he used to rear within, just a few hours before the deadline of an earlier demolition notification was set to end. Earlier, Saturday, a unit of the Israeli occupation army stormed the farm and threatened to carry out the demolition on early Sunday morning, compelling Abu Juheisha to rashly evacuate the 70-thousand-dollar-worth ranch and knock it down on his own or else face additional fine in return for the Israeli demolition. Meanwhile, the IOA has reportedly stepped up demolition threats in A-Khalil’s town of Idna allegedly due to the proximity of the targeted structures and homes from Israel’s Apartheid Wall.